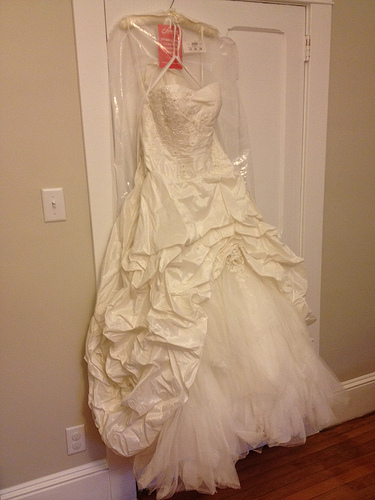 To create the perfect wedding dress, an alteration will always be required. And whether you choose the bridal boutique you purchased it from or a local seamstress, the costs, unless otherwise stated, will come at an additional cost. David’s Bridal is no exception. Even if you purchased your wedding dress here, they will still charge you for alteration, according to the many brides who discussed their prices online. At all 300+ of its locations, according to the official website, they will have on-site specialists who are able to alter your wedding dress that was either purchased in-store or online. How can David’s Bridal alter your dress? What is included in the alteration quote? The entire alter, according to your measurements and specifications, along with a professional press and steam. As mentioned, the company is able to personalize your dress to your liking. Whether it’s adding a new style to a strapless dress, adding full cap sleeves and/or replacing your back zipper with a lacy corset, all locations will be able to provide you a full list of the alterations they are able to do for you. The full amount will be due on the day of your fitting, and if you choose a rush delivery, which often completes in less than 14 days, then this will be added to the final total as well. The company recommends you make the appointment the day you purchase the dress as it can take up to four weeks for the alterations to complete. Depending on your location, the specialist on site will be able to discuss your options. The first fitting typically takes anywhere from 60 to 90 minutes, depending on the type of dress being altered. On the day of your fitting, you will want to bring the exact lingerie you plan on wearing the day of your wedding to ensure the dress fits as planned. Always bring a close friend or family member who is in your bridal party so she is able to learn how to bustle the train. EverAfterGuide.net recommends starting alterations about four to six months prior to the wedding, primarily due to finding a good seamstress as most will be booked for this amount of time.